Next cream the butter and sugar in a bowl with an electric mixer until the mixture is pale and smooth. Add the eggs, one at a time, mixing briefly after each addition. Add the vanilla extract and beat again briefly. Gradually add the flour and baking powder and beat until well combined. Do the same with the bananas. Divide the mixture evenly between the muffin cases, filling each case to about two-thirds full. Bake in the oven for 25 minutes, until a skewer inserted in the centre of one of the cakes comes out clean. 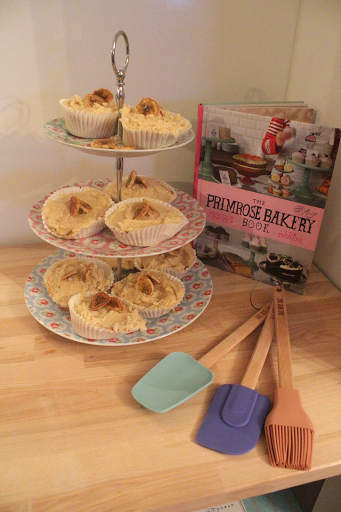 Leave the cupcakes to cool for 10 minutes then turn out onto a wire rack. 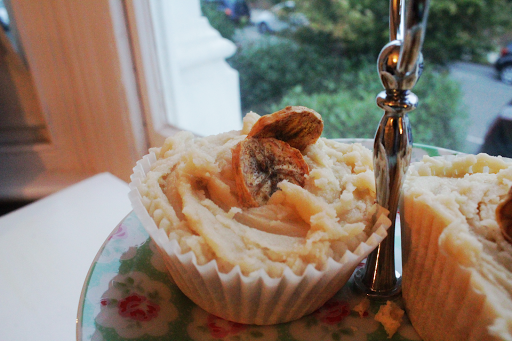 While the cupcakes are cooling time to make your icing. 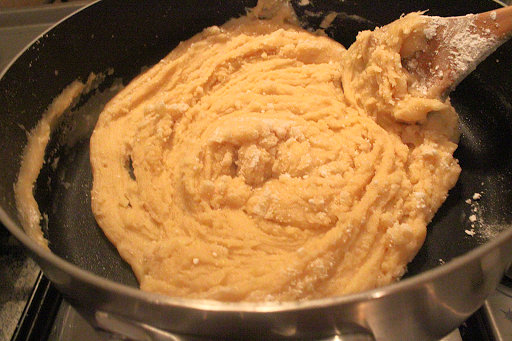 Combine the butter, milk and brown sugar in a saucean and put on the hob over a high heat. Stirring continuously, bring to a boil. Allow it to boil for 1 minute, then remove from the heat and stir in half of the icing sugar. 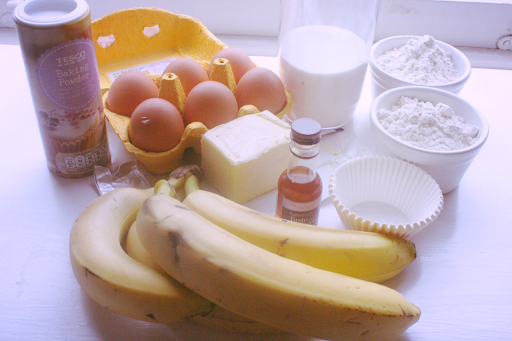 Allow the mixture to cool slightly, then add the rest of the icing sugar and vanilla extract and stir until it thickens. 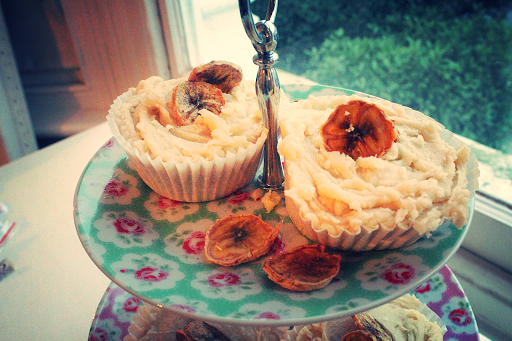 When the cupcakes are completely cool, ice them with the caramel buttercream and decorate with banana chips. 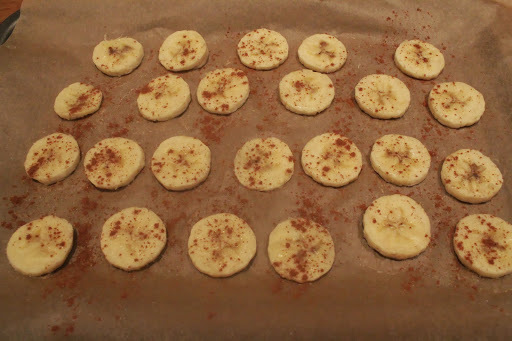 Slice a banana or two into even thin slices and sprinkle with some cinnamon. 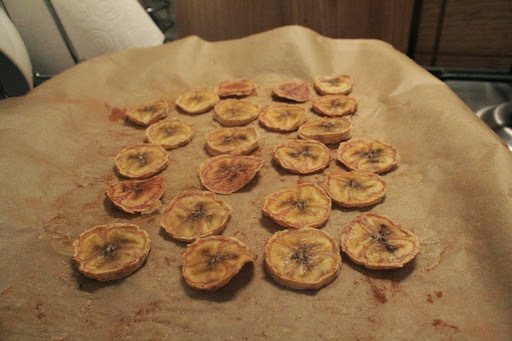 And voila, really easy, minimal effort but impressive homemade banana chips. Use to decorate the cupcakes and scatter extra chips on the plate.